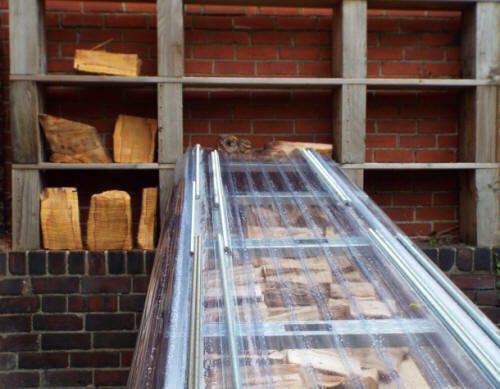 A solar wood store makes use of the greenhouse effect to increase the environmental temperature, and so increase the rate of moisture loss from chopped and sawn wood - the process called 'seasoning.' This is the solar wood store I designed and constructed. The logs are supported on three scaffolding boards, which are supported by a galvanized bin on the left and the wall on the right. The PVC roof is supported by two aluminium C-channels, which are light, strong and cheap. There are four short sections of C-channel inserted into the two long sections, to give support to the PVC throughout its length. Another PVC sheet, placed vertically, forms the wall of the log store to the South. This is a new design, a swift nest box which is installed outside a window but from within the house, without the need to climb a ladder and work at a height to attach a nesting box to its support. This box, a double box with two entrance holes, is very easy to construct and very easy to install. The only woodworking skills needed to construct the box are the ability to saw along a line, to drill a hole and to remove a small quantity of wood with a knife. Very few tools are needed. The box can be constructed in about an hour and installed in not much more than a minute, as the two very short videos I include make clear. The danger of swifts (or other birds) colliding with the window is avoided by the use of polycarbonate sheets, installed at the same time as the box. There are many other anti-reflective techniques which can be used to avoid the danger of collisions with windows. The material in this section is wide-ranging. It includes the practicalities of constructing a swift nesting box and my gratitude for the exhilarating, deeply satisfying, experience of watching, and hearing, these magnificent birds. I live in an area of Sheffield where swifts are plentiful, for the time being. My own small terraced house doesn't offer any entrance holes for swifts. I designed this nesting box to make it much easier to help these wonderful visitors to maintain their numbers, to increase their numbers - and to continue to bring to people like me inexhaustible joy when we watch their soaring and swooping and turning and when we listen to their cries in the summer sky. The entrance holes are a little more than 5 metres above the ground, the recommended minimum height for installation of swift nesting boxes. Instead of climbing a ladder and working at a height to attach a nesting box underneath the gutter, I open the window wide, attach two light clamps to the window frame, pass the swift box from the room to the outside, and, holding the box in one hand (the box is light), use the other hand to push the fixings attached to the red webbing straps onto the handles of the clamps. The box is held securely in place. The polycarbonate sheets are to protect swifts (and other birds) from injury or worse by collision with the glass of the window. Polycarbonate is a much softer and more yielding surface than glass and polycarbonate, unlike glass, doesn't give reflections or the illusion that a free flight path is available to the bird through the window. Polycarbonate has high light transmission and inside the building, there's still a view to be had, although obviously a more diffuse one. There are various other methods of protecting birds which don't involve the use of these sheets. Below, the view from within the room - the nesting box just outside the window, held in place by two of the clamps, which also support one of the polycarbonate sheets, and the view of the motor body repair shop across the road. I could achieve a clear view of the motor body repair shop by using a different method of protecting swifts and other birds from colliding with the window. I prefer to use these polycarbonate sheets. They can obviously be removed at the end of the swift season. Ease of construction is another advantage. The box consists of a plastic planter, black in this case, available from suppliers of gardening equipment, together with a base, made of timber board in this case. I did varnish the base, which obviously adds to the construction time, but this isn't essential. Planters come in a variety of sizes, including ones suitable for smaller, single nest boxes. 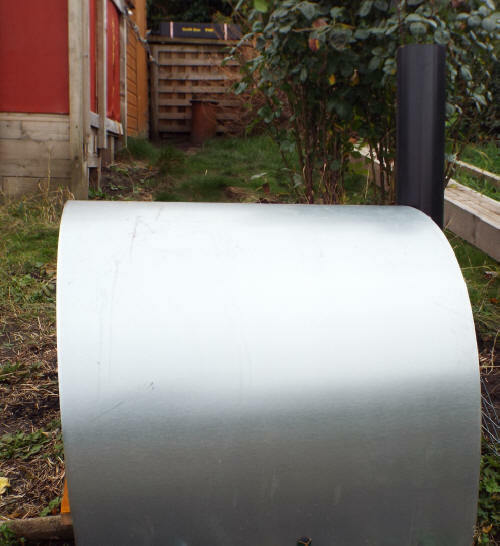 The planter here has a width of 20cm and the timberboard as bought has a width of 20 cm. All that has to be done is to saw it to the right length - a metre, in this case. Plastic protectors can be added to the corners of the base, but I used a jigsaw to round off the corners. A jigsaw isn't an essential tool, though - a rounded corner can be approximated by making cuts at the corner with a saw. A saw (handsaw or power saw) to cut the wooden base to length and to cut the corners of the base if a jigsaw isn't used. (The base may also need to be cut to width.) I used a handsaw. A drill, mains or battery-powered - or a hand drill - to make two holes close together in the base for each entrance hole. The space between the two holes is then cut away. This is very easily done. I used a battery-powered saw. A suitable drill bit is quite substantial but not expensive. The diameter needed is 28 mm. I used a 28 mm auger drill bit of length 210 mm. The point of the auger drill bit allows the centre of each circle to be placed precisely. A chisel or knife - I used a craft knife - is used to trim away excess wood, in this diagram the light area between the two shaded circular holes. This gives an entrance hole of the right shape and a suitable size, in this case 28 mm x 65 mm. The plastic compartment is held to the base by two narrow webbing straps which can be put into place in very little time. In the top photograph above and in the two videos, these straps, narrow and red in colour, are easily visible. These webbing straps are very strong. I use webbing straps (of greater width) in the design of hydraulic equipment, for bending sheet metal and pressing apples to produce apple juice. Obviously, taking the nesting box back into the room and dismantling it, perhaps for cleaning at the end of the season, is a very quick and easy matter too. Installing (and removing) this nesting box is a much less hazardous activity than installing or removing an external nesting box of the usual kind, one which is higher, perhaps beneath a gutter, working on a ladder, but there are possible hazards to passers by. These hazards are easily avoided. Two people are needed to place or remove this nesting box, one inside the room, at the window, and one at street level, who can warn the person inside the room if people are approaching and who can request that they keep away from the area underneath the window. This is a light piece of equipment, not at a great height, but obviously, hitting a passer by has to be avoided. The clamps and webbing straps are so strong that the possibility of their failing can be discounted and in any case, if one clamp or strap did fail, the box can be held in place by the other clamp and strap. 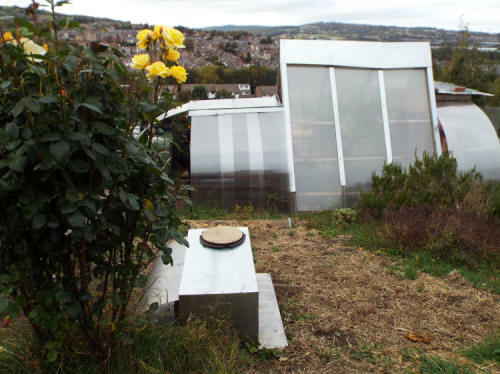 The box is unaffected by strong winds but hasn't been tested in gale-force winds, of the kind which cause widespread damage. Total running time of the two videos, showing actual installation of the swift nesting box - only 1 minute 33 seconds. The box can be installed in even less time. It's very unlikely that the nesting box will be used by any swifts in the area for bringing up young this season, and perhaps for several seasons. More often than not, this is the case with any nesting box installed in or outside a house. The chances of success are increased by playing a CD of swift calls. The open window (only slightly open) would allow the sound to reach the surroundings easily but I've decided not to play a CD. Neighbours here include very near neighbours, and I don't think I can justify playing a CD for so much of each day, beginning very early in the morning, even in a cause as important to me as this. Very much recommended, the established Websites and blogs concerned with swifts, including their material on internal and external nestboxes, as well as so much other material to do with swifts. To mention just one topic, but a very important one, I've found coverage of the 5th International Swift Conference, held in Tel Aviv, Israel earlier this year of great interest. Any comments - including critical comments and suggestions for improving the design - are welcome. I recognize, of course, that the best way of providing a place for swifts to lay their eggs and bring up their young isn't by means of a box installed on the outside of a building, whether the box is under a gutter or, as in the case of this design, outside a window, but by installations provided at the time of building, by swift bricks, and the other means which established Websites on swifts describe and illustrate, and, also, free-standing structures which provide many nesting places. Even so, these methods can't, realistically, be used in nearly enough places. To implement them will generally require contacting builders and architects, without any guarantee of success, the use of methods which are very different from personal construction. People who want to give all the help they can to the swifts in their locality generally have to construct, or buy, a swift box and have it installed, or install it themselves. This design is intended to make the process much easier. After the box has been installed, there's no guarantee of success. Swifts may not use the box, or perhaps not for years, but there's also a strong chance that swifts will use it, helping to arrest the decline in their numbers - to help these wonderful birds. I don't live in an idyllic village but in a suburb of Sheffield, not far from the Hillsborough football stadium. Swifts are birds of town and city suburbs rather than beautiful and idyllic villages. If, hypothetically, I were offered the chance to live in a beautiful and idyllic village rather than here, I'd refuse - I'd far rather live in an ordinary suburb with swifts than a beautiful and idyllic village without swifts. Without the sight of the swifts, the summer skies would seem empty. Without the sound of the swifts, the summer skies would seem silent. This page uses 'Large Page Design.' It's wide as well as long (or fairly long.) It can't be viewed adequately on the very small screen of a portable device. Some of the designs I describe on the site, on this page and my pages on gardening and construction, such as the illustrated introduction, are called 'PHD' designs. 'PHD' stands for 'Paul Hurt Design.' There's no reference to 'PhD,' the name of the higher degree. I don't have a PhD degree and I don't have a business called 'PHD.' Starting a business wouldn't be a realistic possibility for me in the least, for many reasons, including the fact that I've a range of very different interests which take up a very great deal of time, as the Home Page will make clear, and no interest at all, or not much of an interest, in some of the knowledge and skills needed to run a successful business, such as financial matters and taxation. Running a business would take me away from matters which are very important to me. I'm also past retirement age. I use 'PHD' simply to refer to designs of mine which I think are different from established designs, with some advantages. For example, the low level sheet metal workbench described on this page allows for much easier and safer handling of sheet metal. The design has no screw, nail or bolt fixings and the bench is particularly easy to erect and to dismantle. More images of the workbench in the section my workshop. No innovations are possible in workbench design and construction - everything that could have been thought of has already been thought of. That's a common opinion, but I don't share it. I'd claim that the PHD workbench does include innovations, even if the innovations aren't dramatic. Of course, I don't claim, of course, that an improved workbench necessarily leads to improved woodworking or metal working. There's general agreement that a good workbench has to be solid and heavy, to provide a stable base for holding the wood or metal which is being worked. I don't dispute that. I think the same. The workbench I've designed is solid and heavy. Manufacturers charge much more for very solid and heavy workbenches than for very light and flimsy ones, but this one is cheap to construct. I used an old door for the top of the bench - it had been thrown out and put in a skip - together with a plywood sheet, but if a free-of-charge door can't be found, the cost of the workbench is still very low. For reasons I explain later, I put the door on top and the plywood sheet underneath. Anyone who wants to build a similar workbench and has a usable door is completely free to do it differently. This workbench is very easy to move, as I explain now. Workbench design doesn't have to be like tent design - the ideal backpacking tent is very spacious, very light, very strong - capable of withstanding gales - very cheap, very easy to erect and very easy to dismantle. In tent design, far more than workbench design, the problem of incompatible ends is a real one. In workbench design, it's much easier to achieve advantages without corresponding disadvantages. We can move the workbench within the workshop or working area very easily, without taking it to bits. We can move the workbench longer distances by taking it to bits, something which is very easy. It's just as easy to assemble it. How do we move such a heavy object within the workshop or working area? Answer, the bench has a jacking point. Place a heavy hydraulic jack or a small and light hydraulic bottle jack or a non-hydraulic vehicle jack under the jacking beam, at more or less the centre of the beam. I see advantages in equipping workbenches, like motor vehicles, with beams which are strong enough for the purpose. These beams are at the ends of the workbench, not the sides, of course. When one end is in the air, attach blocks to the two legs - or supporting members - of the workbench at this end. The blocks are equipped with heavy-duty spindle castors. These castors have brakes, so that once the other end is raised, the castors don't move. Operate the jack so that this end is gently lowered and the castors take the weight of the workbench. Go to the opposite end and do the same. There's no need for the castors at this end to have brakes. Once this end has been gently lowered, the workbench is mobile. Why is this workbench so easy to erect and dismantle? Primarily, because it doesn't rely upon mortice and tenon joints. The pieces which make up the workbench are either bolted together, with carriage (coach) bolts or, in some cases, where strength isn't a necessity, by means of screws, Unlike nails, of course, screws can easily be removed. The screws used in this workbench are substantial ones of M12 diameter, but are easy to insert and remove, with the aid of a club hammer. Above, the workbench. The wooden straight edge for guiding the jigsaw has now been replaced with a metal straight edge, which has the advantage of greater weight as well as an edge which is more exact. The workbench is suitable for work with a router as well as a jigsaw. What are the advantages of having a sheet metal workbench as low as this? Above all, much greater safety in handling sheet metal. The sheet metal I have is stored against the wall to the right of the bench. If I had a bench of the usual 'bench height,' I would have to get hold of the sheet and lift it on to the bench. A sheet of sheet metal isn't too heavy but it is large and unwieldy. It flops around in an irritating - and potentially dangerous - way. The corners of the sheet metal are protected by my system of plastic clip-on units, more or less eliminating the dangers but not eliminating in the least the difficulties - these materials are much more difficult to handle than structural steel bars or most other things, even for two people. I do need help bringing in the sheets from outside to this storage area. A fork-lift truck can transport sheet metal in a horizontal position, but people always carry them in a vertical position, for obvious reasons. Why should anyone need to take out a vertical sheet from storage, rotate it to the horizontal position and then lift this very, very cumbersome thing quite some distance and then place it on a bench at approximately waist height? The section which follows this describes my earlier sheet metal workbench - a good design, I think, in many ways, but with the great disadvantage of being simply too high. My bench allows a far easier way of working. I simply get hold of the upper edge of the sheet - with an extended arm, keeping a safe distance - and pull it away from the wall so that it falls to the left, onto the low-level bench. Adjustments are made to the position of the sheet and then the sheet is clamped to the bench. The clamps shown in the image above are spring clamps, used in pairs. One clamp grips a wooden support, a scaffolding board. (The placing of these boards is explained below.) The other clamp grips the edge of the sheet metal and the clamp which has already been applied. This system is very, very quick and very secure. The sheet metal can't move at all. In this stable position, the sheet metal can be cut. For straight cuts, including long straight cuts, the wooden straight edge shown in the image above is used. It acts as a guide for a jigsaw. The wooden straight edge is clamped to the sheet metal at the front edge using one spring clamp. The straight edge is secured at the far side using a very simple but very effective method. It's simply weighed down with the two blocks, which are oak and heavy - heavy enough to allow no movement of the straight edge during cutting. Moving a sheet from storage to its position on the bench only takes a few moments - from a position of safety - rather than a much longer time, in a position which is potentially dangerous and at the least, something of a struggle for two people and all but impossible for one. When the work has been carried out, it's very easy to lift the sheet - or sheets, if the sheet has been cut into more than one piece - back into the storage position by the wall. Setting up the straight edge takes only a few moments. The workbench is very simple and very quick to set up, and to dismantle. The components can easily be stored and take up very little space. The main components are simply four sections of scaffolding board, each of them 22cm high, separated by six sections of oak sleeper. Sections of softwood sleeper can also be use. Each of these sections is 30 cm long and 10cm high. 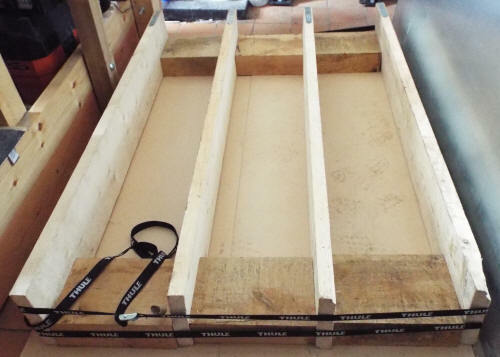 These sections of sleeper and scaffolding board (longer, complete scaffolding boards can also be used) aren't joined in any way, by nails, screws or bolts. The components are simply held in place by two long pieces of webbing. The ones here are the kind used to secure loads to roof racks. The components rest on hardboard here, but can also rest on the floor directly. The weight of the oak sections effectively prevents any movement during cutting. Longitudinal cutting of sheet metal is obviously carried out parallel with the sleepers. If it's necessary to cut the sheet metal in a place where one of the scaffolding boards would get in the way, the sheet metal is simply unclamped and moved to the left or right, so that there's no obstruction, and then re-clamped. Transverse cutting takes place nearer to the three blocks at the far side. A straight edge is secured, and the metal can be cut easily. Above, reducing dangers in sheet metal work: unprotected and protected corners of sheet metal sections. Unprotected corners are very sharp corners, which can kill or injure. Experienced sheet metal workers know about the hazards of sheet metal and take good care to avoid them. Even so, they may well be injured, perhaps when they're very tired and don't keep well away from the hazards, which include not just sharp corners but jagged edges of sheet metal. The companies which sell sheet metal, in my experience, take absolutely no interest in matters of safety. They may assume that every customer is an experienced sheet metal but someone who has only recently become interested in working with this very interesting material is able to take away the sheet metal, with unprotected corners. Sheet metal comes in large sheets. Moving them calls for great care, but even with great care care, accidents can easily happen, when sheets have to be taken up stairs or moved round corners, for example. In the lower part of the image here, the corners are made more or less harmless by the addition of plastic corner pieces. I use the plastic pieces which are sold to hold together loose printed sheets, easily obtainable from shops which sell stationery materials. It's just as easy to protect any jagged edges of sheet metal in the same way, although it will take more of these plastic pieces. As I explain in the previous section, this bench has been replaced. The material here is archive material. Above, a view of part of the machine I designed and built for bending sheet metal and for making the cutting of sheet metal easier. It's also a workbench for general sheet metal work (to mention just one activity, joining sheet metal sections by riveting) and a supplementary bench for other work, such as general metalwork and woodwork. It can be used for joining sheet metal sections by riveting, for example. It's housed not in my workshop but in another room. The sheet metal is fed into the machine between the two perforated steel bars. I already owned a machine for bending sheet metal but the maximum width of the sheet metal which the machine can bend (by non-hydraulic power) is only 600 mm. This machine will bend sheet metal up to a width of 1300 mm by hydraulic power. I made use of webbing straps (one of the two red straps visible here) rather than steel components when the forces are purely tensile, not compressive. I think this is a very useful design feature, which can be used in machines of many different kinds. Webbing straps can withstand considerable forces without breaking. 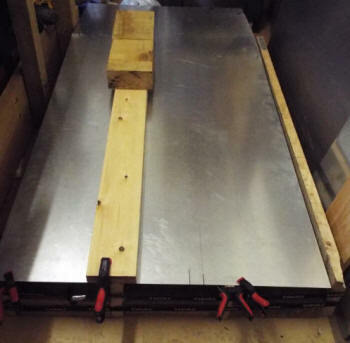 When the machine is used for cutting sheet metal, the sheet is placed on top of the two long and strong boards which form the upper surface and secured with clamps - there are two G-clamps which can be seen towards the left. To the right of the G-clamps is another clamp. Its main use is clamping metal which is being drilled in the pillar drill of the workshop. On the far left is the equipment which does the cutting (Stakesy's throatless hand shear.) On the right is a bench swager and slip roller used amongst other things for strengthening sheet metal. On the nearer of the top boards is a router guide, useful for measurements of length. To cut the sheet metal, the cutter is placed within the channel which separates the two boards, at one end of the channel. The channel is 12 cm wide and 10 cm deep. The cutting blade is at the correct height for cutting the sheet metal. In this position, the cutter can be moved forward. As it advances, the handle is operated to cut the metal with the blade. The cutter can be used without the machine, but it's much harder to obtain a straight cut - if a straight cut is the intention. The machine, and the separate cutter, can also be used for curved cuts. Again, the machine makes the process easier. Above, part of my kitchen-workshop, not in the least elaborate. Most of my work is carried out with portable tools in the open air. On the workbench here there are tools which do use mains power, a router, with attachment, a drill press, a saw, manufactured by 'Evolution,' which can cut a range of materials, structural steel as well as wood, and an Evolution jigsaw. Some tools can be stored underneath the bench, but others are fixed. These include a sheet metal bead roller and a sheet metal folder. The bench is a 'transverse extension bench.' The wooden extension houses a very substantial Record metalworking swivel vice on the night but there's free space available to the left. The extension can be extended, giving more available space to the right of the vice. There are many more tools than the ones shown here. Some of them, including a chainsaw, an electric planer and a rotary sander are stored underneath the bench. Others are stored in tools cabinets in the workshop, or on one of the walls not shown here. Above, another view of the workbench, showing some of the large area available for storage underneath the bench. As will be obvious, the workbench top was constructed using a wooden door (with a layer of plywood underneath. The four recesses in the top of the workbench are useful for retaining a wide range of tools, fixings and other items, largely eliminating the risk of accidental falls from the bench onto the floor. 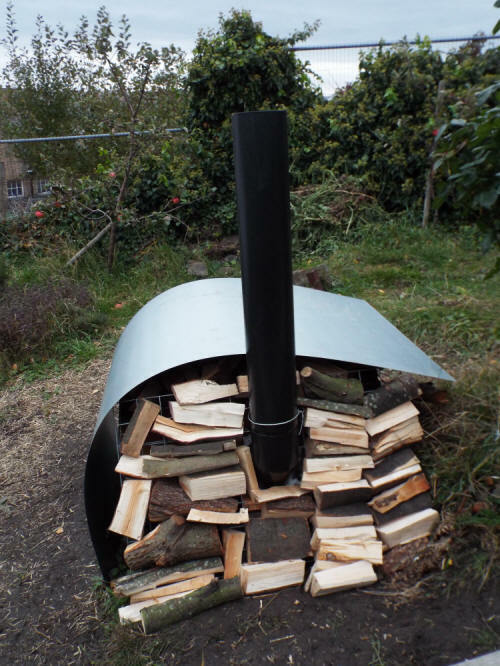 Above, an outdoor project, in the backyard / back garden - a very simple structure for storing wood to be used in a multi-fuel stove. 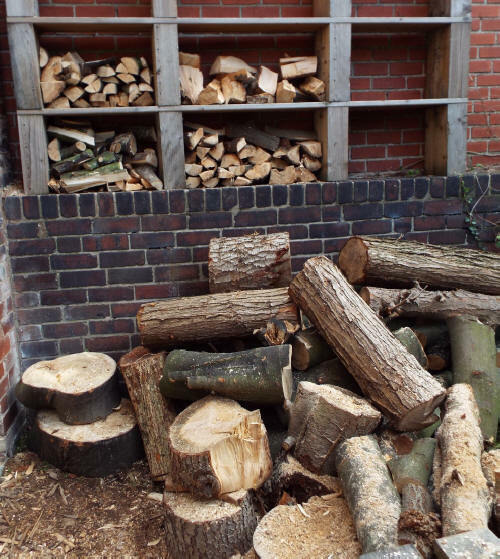 The wood store is in my small back garden. 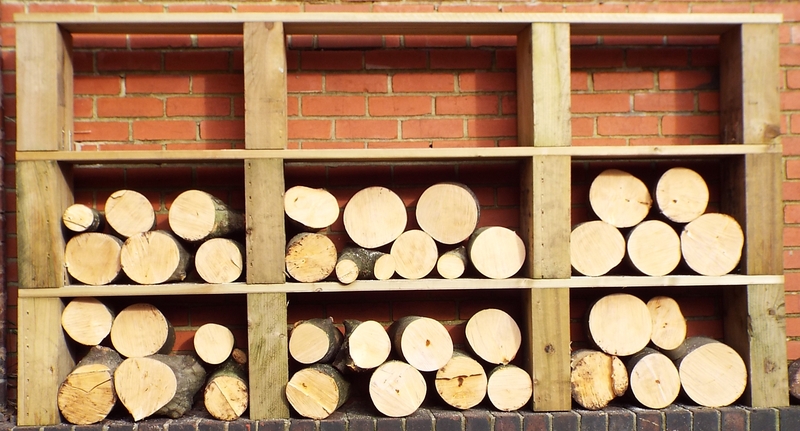 The wood store is constructed from off-cuts of railway sleepers, which support horizontals made from decking boards. The store still has to be finished with oil/varnish after it has dried out. The log sections here still have to be cut into smaller sections for seasoning. Another outdoor project, a stand for supporting a chainsaw, used for sawing logs and branches, particularly repetitive sawing. A safer way of using a chainsaw for tasks like these. This chainsaw has now been replaced with a better model, a Grizzly chainsaw. Above, two views of the equipment I made for steam bending of wood. The wood to be bent is placed in the inner steel container, which is filled with steam from a steam generator. The container is well insulated with the foam, inside the larger steel container. Next to the steam bending equipment, the chainsaw stand. The outdoor oven is located in my upper allotment. For the time being, most of this section is made up of material from the entry for 2018 on my page Gardening/construction: introduction, with photographs. A new design, with advantages. The oven can be used for cooking pizza and for many other purposes. This photo shows the view to the North. There's a pizza stone placed on top of the oven, which is here at an early stage of development. The rose shown here is the variety Arthur Bell. The oven blends with the greenhouse and extensions. In October, I placed more bricks in the oven to increase thermal mass. More bricks were placed on the left of the open side, to reduce the size of the opening. The opening is now 64% of this side. The figure of 63% is often given as the optimum. I also added a horizontal section of welded wire mesh to the top of the oven, the section supported by another section of wire mesh at the rear. The horizontal wire mesh can be used for various purposes. 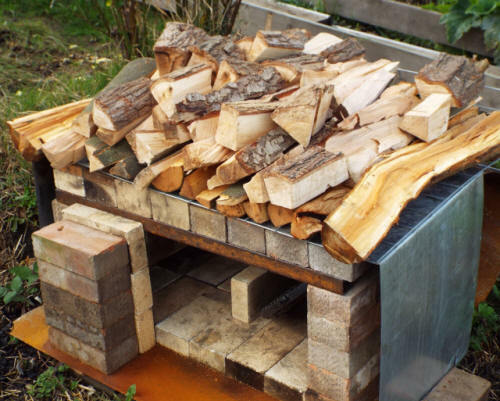 The primary use is for storing, not seasoned wood to be used in the oven, but unseasoned wood whose drying will be aided (even if not very much) by the heat given off by the oven. The roof of the oven incorporates rectangular steel section, supporting fire bricks. The roof is well insulated, then, but the stored wood increases the level of insulation. Very soon after, a curved galvanized sheet was added to protect the wood, which, after all, is drying, from the rain. It also improves the appearance. The curvature of the sheet allows it to shed rain easily but the top of the sheet (which is supported by the wood stored below) has very gentle curvature and can be used for supporting all kinds of things when the oven is used - cooking equipment, for example - and as a work surface. I use it for transferring rolled-out dough to a metal pizza support before adding the topping. This is much more convenient than having a table nearby and using that. 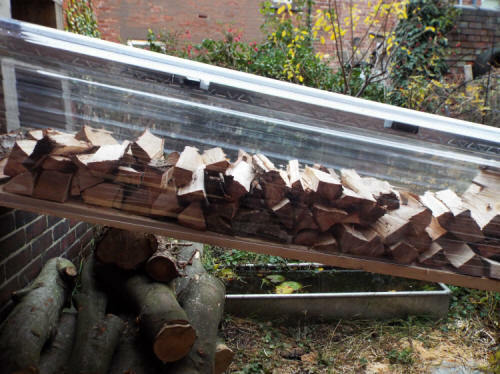 The wood stored on top of the oven and on the sloping metal rack near to the chimney comes from the wood store in my back yard. The sloping metal rack is just visible in the image below, at the left. This rack supports the horizontal rack which in turn supports the wood shown above, hidden from view now by the curved sheet metal.